When powering the SRM150 speaker, the blue power LED lights up and you hear a noticeable hiss coming out of the speaker, even with the MAIN level completely turned down. Turning the MAIN level above 5 makes a loud popping sound and the cone of the speaker visibly travels backwards very hard. 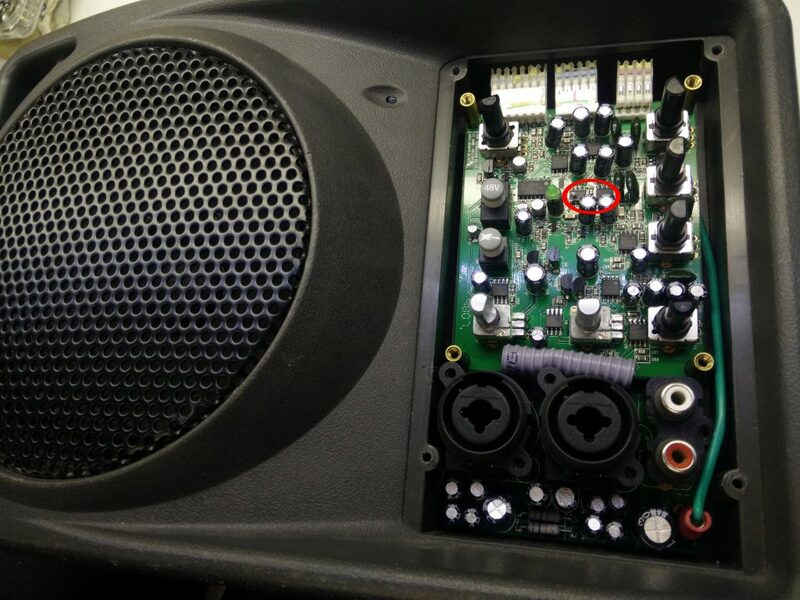 No output from the speaker when feeding in a signal. When turning off the speaker with the POWER switch at the back, it makes a loud popping noise. 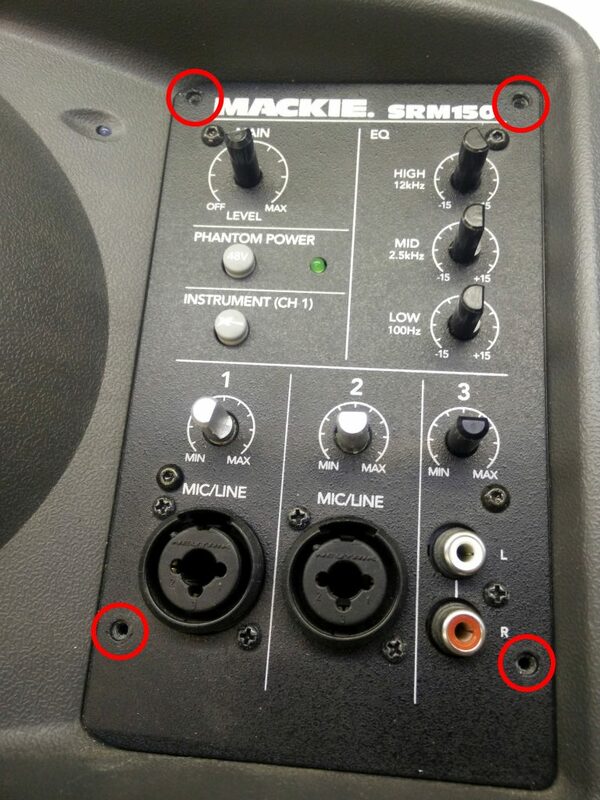 Start with removing the six volume and EQ knobs by pulling them off. Pull them firmly, but do no wiggle them. If needed, wedge them loose with a plastic spudger. 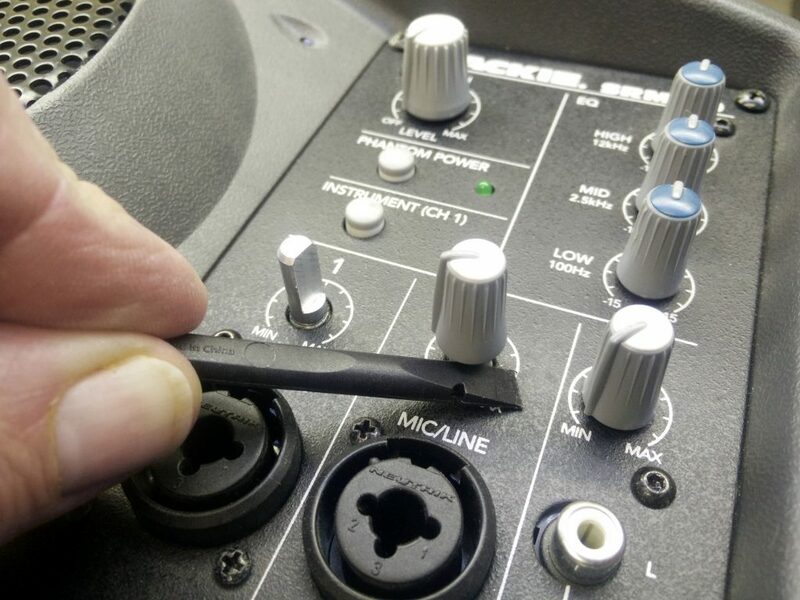 Remove the four screws in the outer corners of the mixing panel with a Phillips #1 screwdriver. 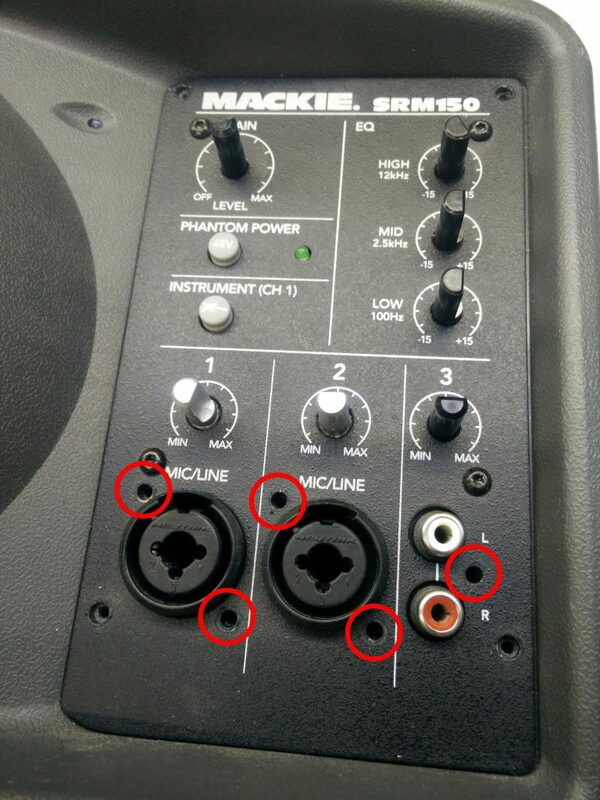 Remove the five screws near the bottom surrounding the three inputs with a Phillips #0 screwdriver. 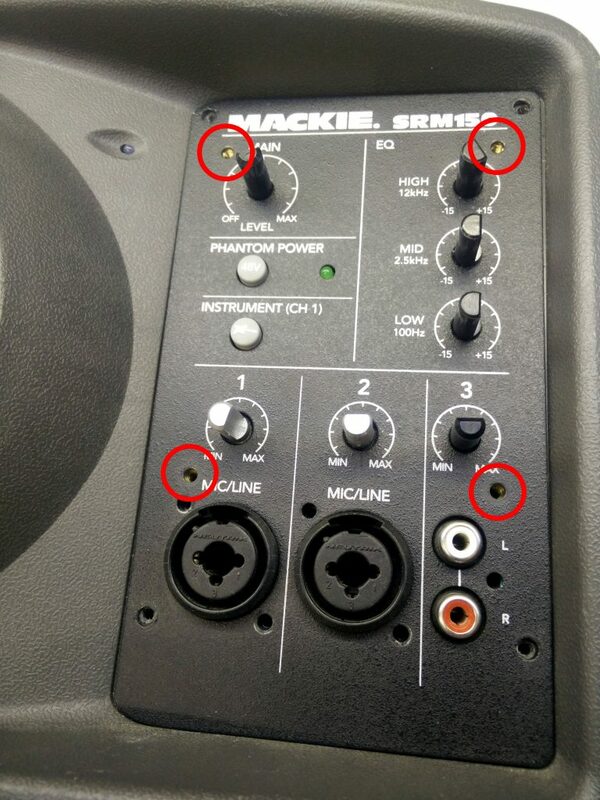 Remove the four remaining machine screws with a Torx T8 screwdriver. 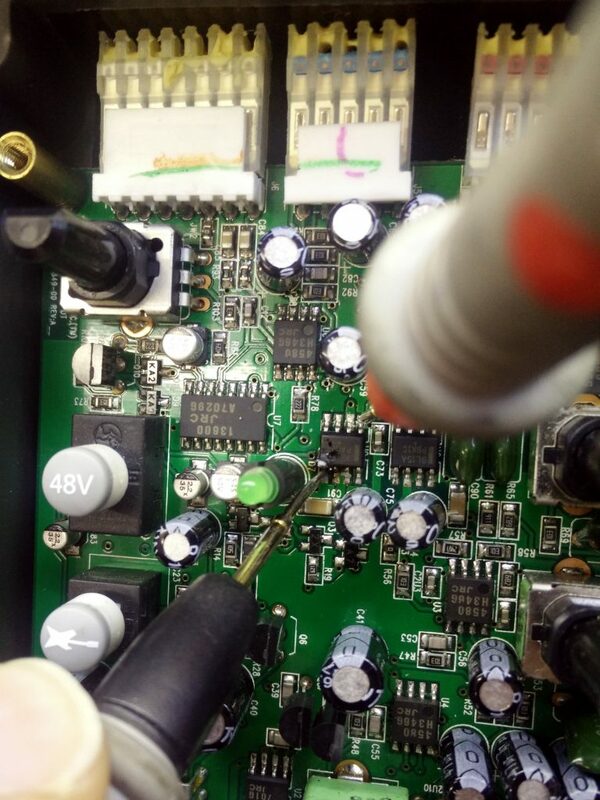 Since there are no screws left, you should be able to lift the metal face plate of the mixing panel, exposing the printed circuit board that holds the components of the mixer. 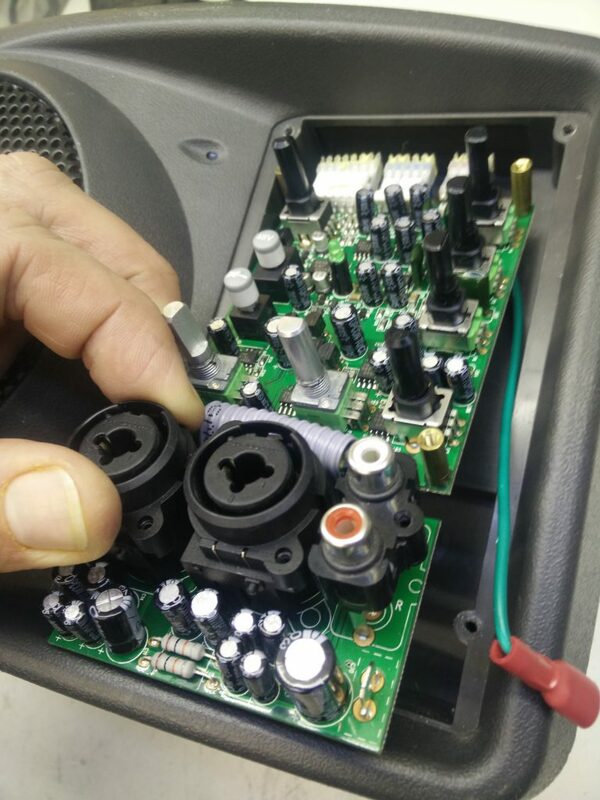 We will be replacing the integrated circuits marked 9L15A or 8L15A, depending on which one is defective. Measure the voltage on the two right pins of J4, you should get about 25V. Measure the voltage on the two center pins of J4, you should get about 25V. 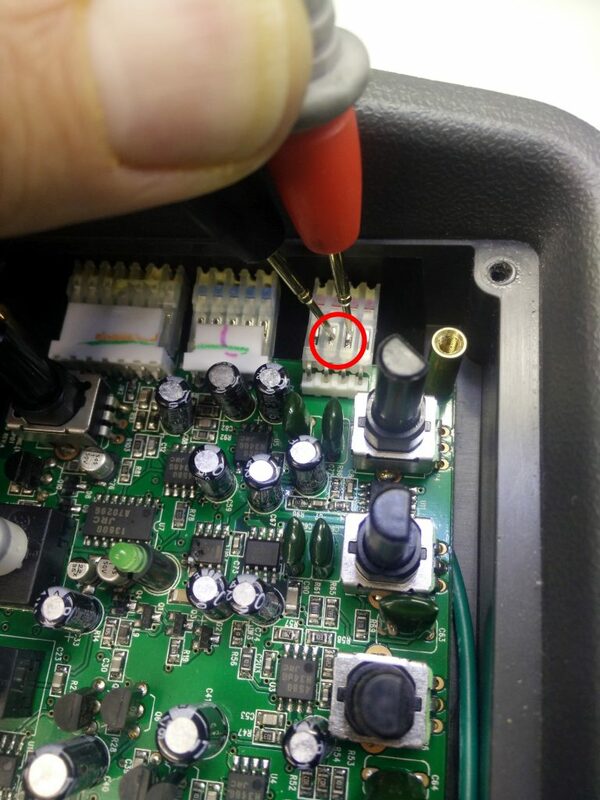 If you get twice 25V, the input power for the mixing board is OK. We will now proceed checking the on board +15V and -15V voltage regulators. Measure the voltage over pin 1 (Vout) and pin 5 (GND) of U9 (the eight pin integrated circuit at two o’clock of the green LED. If it is -15V it is OK, if it is less (I measured 0.8V), we will replace this integrated circuit. When looking at the board with the connectors facing upwards (like on the photo), pin 1 is the the top right one and pin 5 is the bottom left one. Measure the voltage over pin 1 (Vout) and pin 6 (GND) of U8. 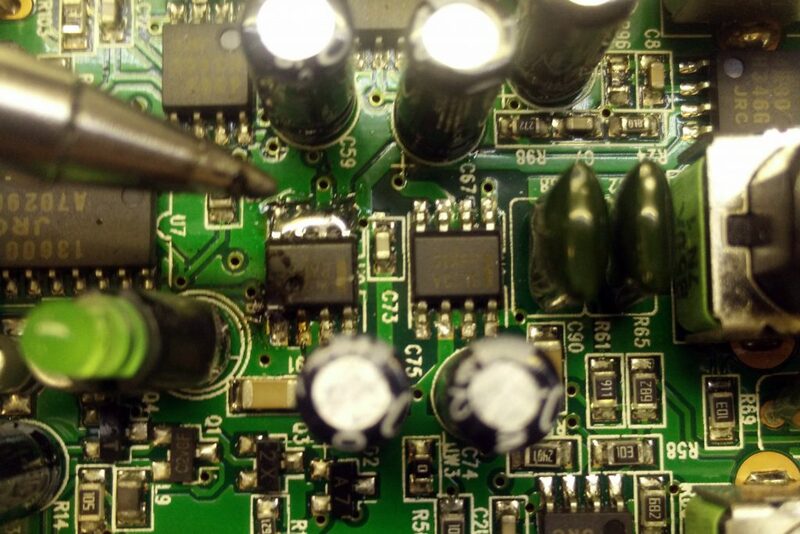 If it is 15V it is OK, if it is less, we will replace this integrated circuit. In my case the voltage was 15V. When looking at the board with the connectors facing upwards (like on the photo), pin 1 is the the top right one and pin 6 is the the second from left on the bottom row of pins. Take note that these components are also available in a TO-92 package (3 leads), make sure you get the SOIC-8 package! Power down the SRM150 with the power switch on the back and unplug the mains lead. 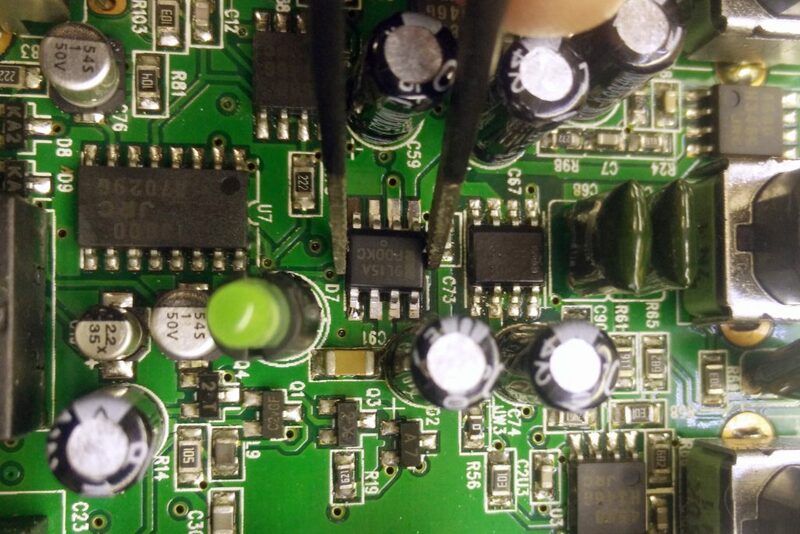 Unseat the red spade connector of the green ground wire from the circuit board. Wiggle gently to loosen it. 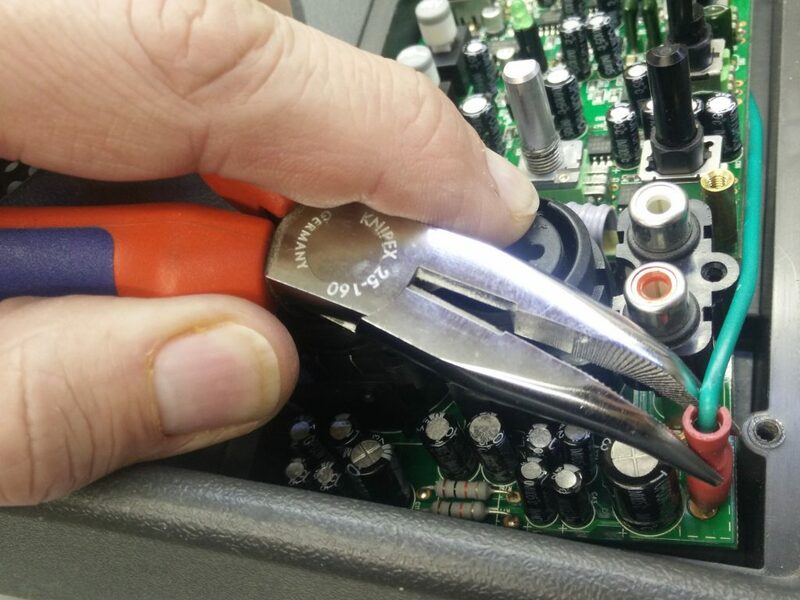 Use needle nose pliers to grip the spade connector if needed. Lift the lower part of the circuit board up and out of the enclosure. Disconnect the three connectors at the top of the board. The board should now be loose and you can remove it completely. Remove the defective integrated circuit. 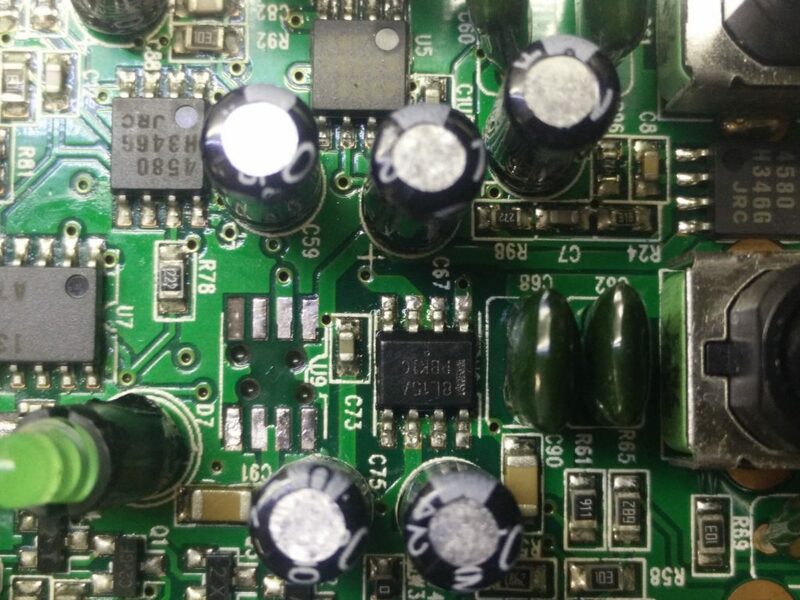 As these are surface mount components, this is not easy but not impossible. I normally use a hot air soldering gun for a task like this, but the surrounding electrolytic capacitors make the integrated circuit hard to reach. I decided to perform the operation with a soldering iron: add lots of solder to one row of pins so that all of them are soaked in a liquid solder blob. 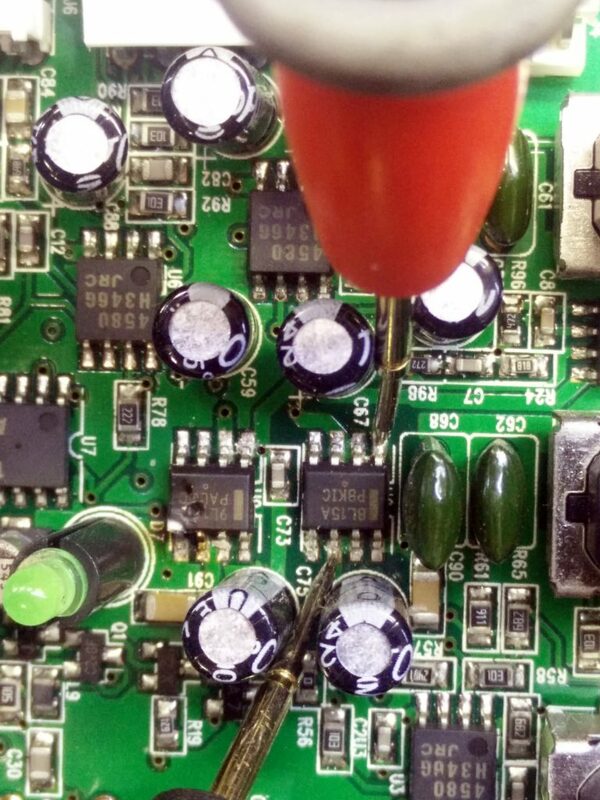 While heating the blob with your soldering iron, lift that part of the integrated circuit from the board by prying between the integrated circuit and the board with a fine flat screwdriver. Try so perform this as swift as possible to mitigate overheating of the boards, otherwise the copper traces and pads could loosen due to excessive heat. But also be gentle, prying to hard could also lift a solder pad. Repeat for the row of pins on the other site of the integrated circuit. This should free the defective component from the board. This time you can use tweezers to hold the integrated circuit and lift if from the circuit board. 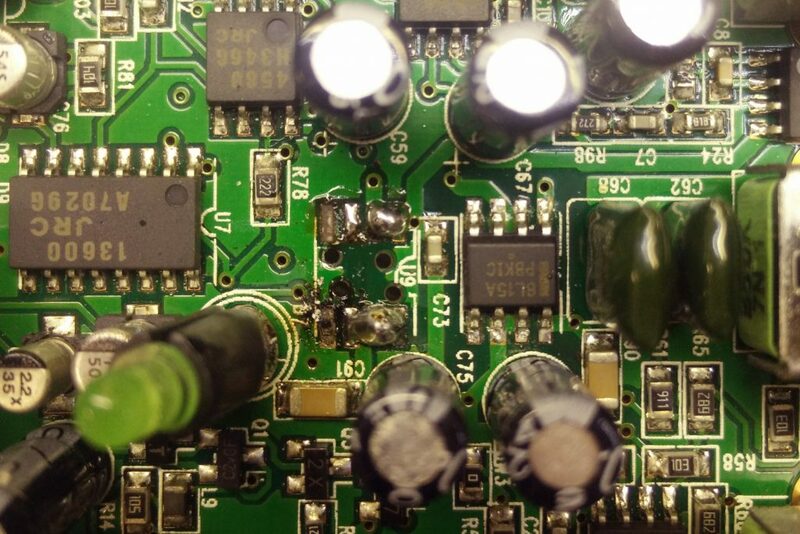 There is now probably some excess solder on the board. Remove it with desoldering braid. You can see on the photo that I was a bit to harsh and I lifted the pad for pin 4 (top left on the photo). Luckily, this pin is not connected and the pad leads nowhere. Add a little bit of solder to one of the corner pads for the integrated circuit. Place the new integrated circuit over it and apply heat with your soldering iron. 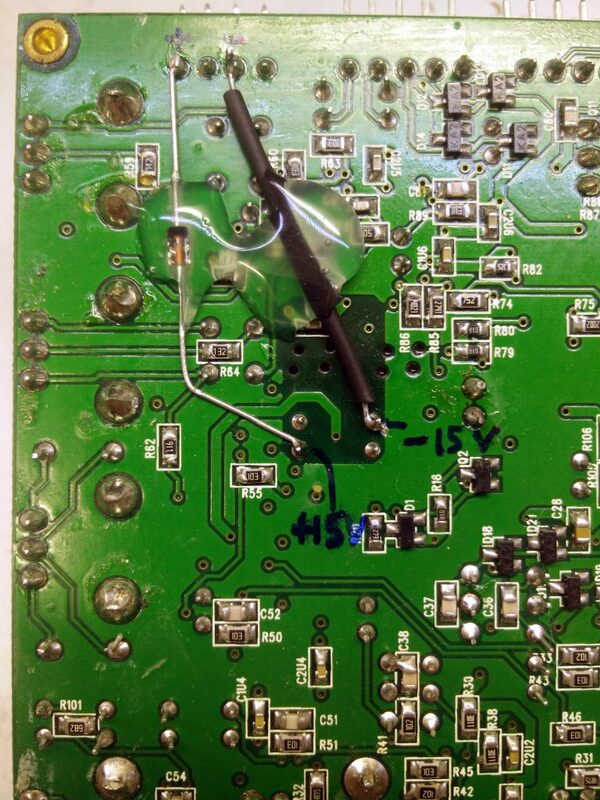 Reheat the solder joint if necessary to reposition the integrated circuit with the tweezers. When positioned correctly, solder the remainder of the pads. 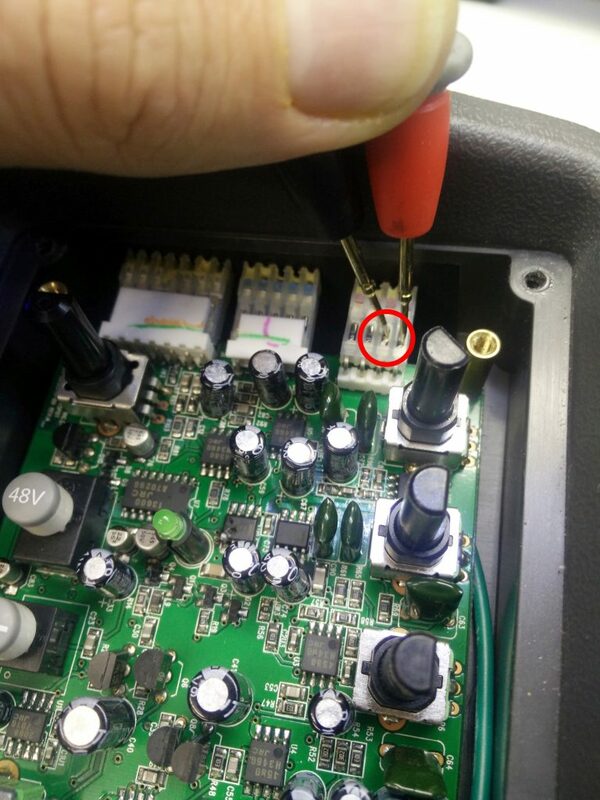 Check to make sure that there are no solder bridges between the pads. The repair is finished, but this has not resolved the possible root cause of the defect. 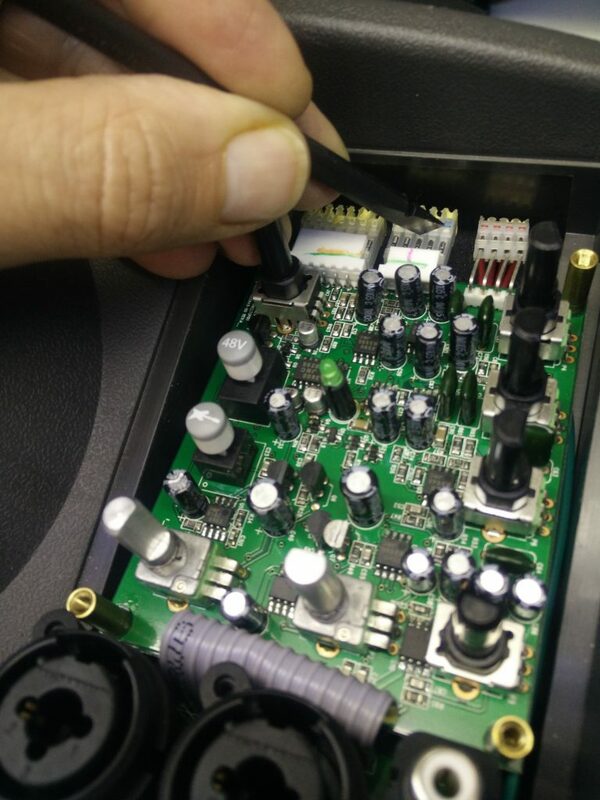 The SRM 150 Service Bulletin (2008-8-17) has a Rework Procedure for the SRM150 Preamp RevB or earlier. 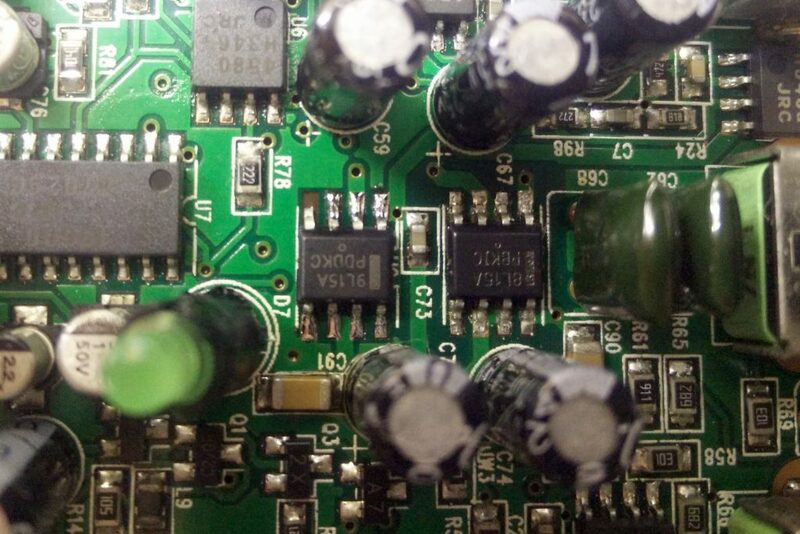 It consists of adding diodes around the +15 vdc and -15 vdc regulators in the preamp of the SRM150. This is a preventative measure to increase the longevity of these regulators. So better to add these two diodes before connecting the PCB again and closing it all up! You will need two 1N4148 diodes. Very helpful post. I had two srm 150 units fail in one week and both had virtually the same U9 readings you described. I wanted to do as you recommend and go the extra step to add the 1N4148 diodes but I couldn’t locate the service bulletin you mentioned. Do you have a link to it? The link does not seem to exist any longer. How are the diodes oriented with respect to the “+” and “-” sides of the diode? The repair tutorial was just what I needed. Clear, concise. Great pictures. Nice to hear that. I have fixed the link. Abdul, please note that a lot of electronic components are available in different packages. 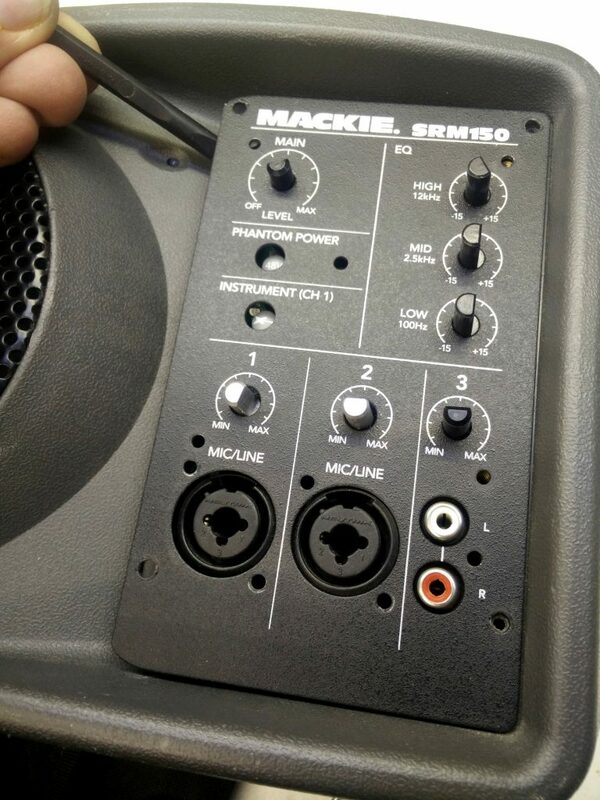 You probably got a TO−92 package while you need a SOIC−8 package in the Mackie SRM150. The manufacturer notes this with a small suffix in the part number: MC78L15ACP (P suffix) for the TO-92 and MC78L15ACDR2G (D suffix) for the SOIC-8. You can find more info if you look for the data sheet of this part by ON Semiconductor. THANK YOU THANK YOU. I also had .8 v on my U9, the U8 is good. Thank you again.. This is what I get for back feeding 48V Phantom power into the XLR plug from a different source. All done, I also added the 1n4148 switching diodes. Getting the IC off was fun, I floated it, but it still did not want to play nice… thanks a again, saved a bunch.